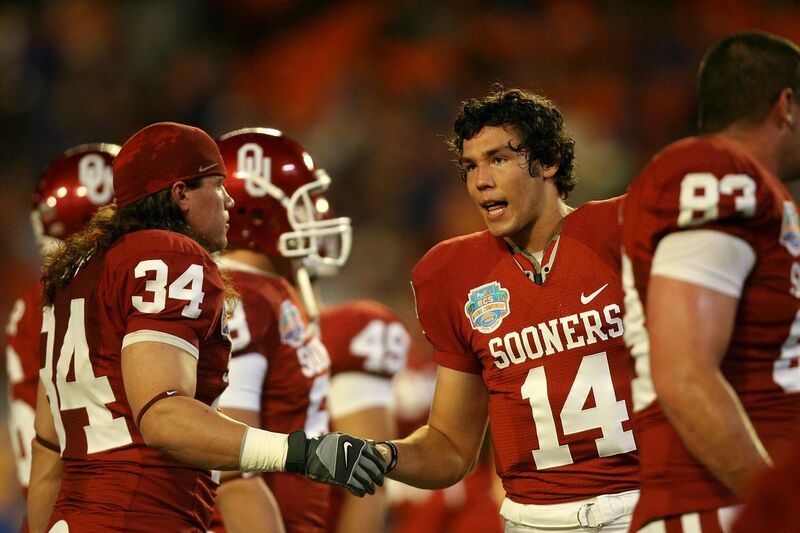 It’s time to celebrate some of the best hair in the history of Oklahoma football. What’s up, Sooner fans? Just so you’re up to date, there are 34 days remaining in our Countdown to Kickoff! Because of that, I’m going to use this opportunity to look back on a former player who was known for blocking, toughness, and above all, his glorious mane. Yes, I’m talking about fullback Matt Clapp. The Phoenix native began his collegiate career in Norman in 2005, seeing minimal game action during his first two seasons. After redshirting in 2007, Clapp established himself as an important element for offensive coordinator Kevin Wilson and the Oklahoma Sooners’ record-setting 2008 offense. Clapp will always be able to say he had the chance to block for guys like Heisman Trophy winner Sam Bradford, all-everything running back DeMarco Murray, and a number of other offensive studs. However, he wasn’t always the one doing the blocking. Occasionally he’d have his number called, and when he did, he showed off his skills. That 28-yard touchdown reception against Texas A&M in 2008 was the longest of his career, and since it came at the expense of the Aggies in College Station, it’s that much sweeter. But the best part, of course, is that hair. You can’t miss those luxurious locks as they flutter about with Clapp sprinting down the sideline. ‘Twas a special moment in time, indeed. By the end of the 2009 season, Matt Clapp was named to the All-Big 12 First Team and All-Big 12 Academic First Team. Once he wrapped up his Sooner career, Clapp took his talents to the next level. The Detroit Lions signed him as an undrafted free agent in 2010. A year later Clapp spent a brief stretch in Tampa Bay before calling it a career. There may never be another Sooner like Clapp. It would take a special player to be able to do what Clapp did on the field while simultaneously rock the best hair in the stadium. Not an easy feat, but Matt Clapp’s a guy that could do both. Hot Links: College Football Playoff rankings, a Big 12 rematch, and more! Hot Links: A last hurrah for the seniors, Murray meets with the Cards, and more!